Navratri / Dusserah is nearing and many of my tamil friends would be busy in setting up 'Golu'. We don't have a custom of setting a golu. However we celebrate it by offering Sundal or sweet (Neivedhyam) to Goddess Lakshmi all those 9 days. Since the preparation of sundal is very easy, for all 9 days, different sundal recipes would be prepared. I have some basic sundal recipes in my blog. For variations, my mom sometimes add different masala's to bring difference in taste. 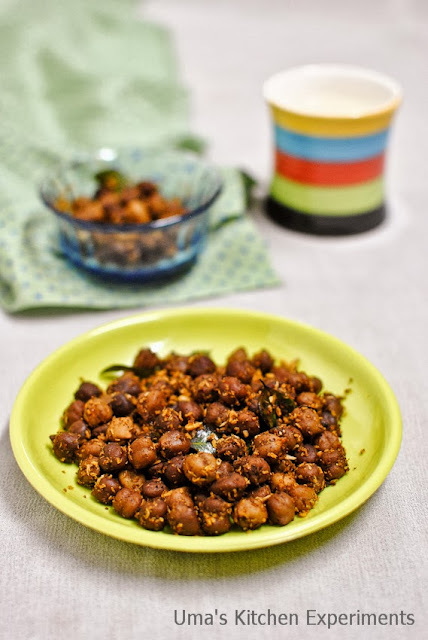 Be it using coriander seeds or cumin seeds, it depends on the legume(sundal) used. She also adds coconut in all the masala based sundal recipes. Here, I present one of those masala sundal recipes. 1) Wash and soak black chickpeas for 8 hours or soak it overnight. Pressure cook it for 3 whistles by adding enough water (just to immerse the chickpeas) and salt. Allow the steam to suppress. 2) Meanwhile, dry roast the ingredients given under the section "For Masala". Allow it to cool to room temperature. Once it cools down, make a powder of it. Keep it aside. 3) By now, the steam would have released from the pressure cooker. Open the lid and drain the excess water. Keep it aside. 4) Heat oil in a pan. Add mustard seeds. When the mustard seeds splutter, add curry leaves and asafoetida. 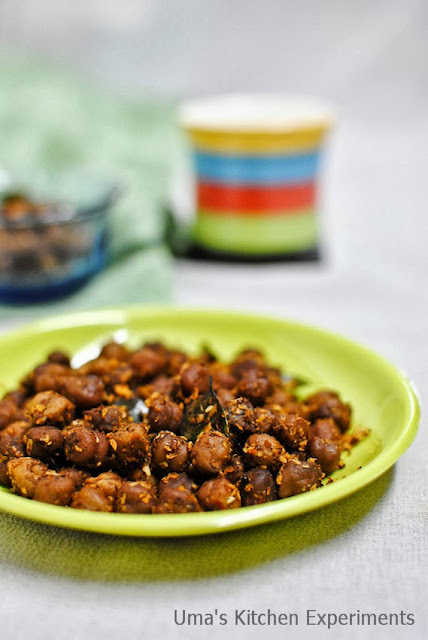 5) Add cooked black chick peas. Mix it well. 6) Add ground masala and grated coconut. Mix well again and cook for few seconds. 7) Turn the stove off and serve it warm. 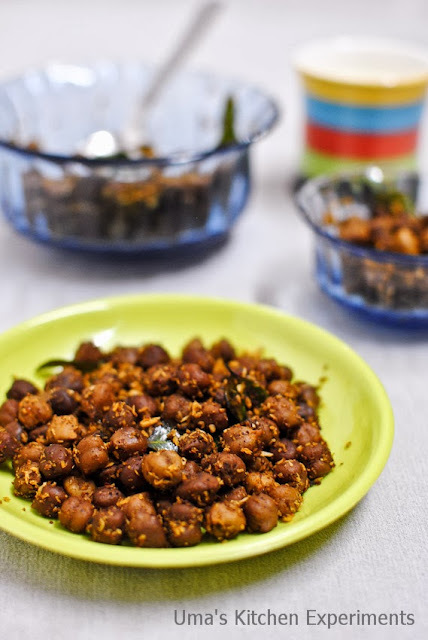 1) You can also add urad dal instead of channa dal or both in the masala used. 2) Skip coconut if you don't prefer it. 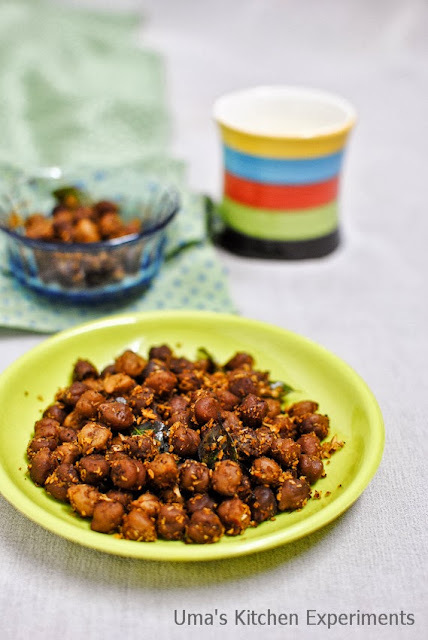 love this kind of spicy sundal...looks inviting! I dont mind inviting myself to ur place to enjoy this delicious sundal.